They appeared at Belfast Magistrates' Court on Saturday. The court heard the Ulster Volunteer Force (UVF) has been "flooding the streets of Belfast" with drugs. A defence solicitor applied for bail for Mr Baine, saying that others with a "more serious role", including "a top player", had already been released on police bail. When asked by the judge about his client's occupation, the solicitor said that Mr Baine did not work or receive benefits but has "a small amount of savings". The judge refused bail because of a "real risk" of more offences being committed. 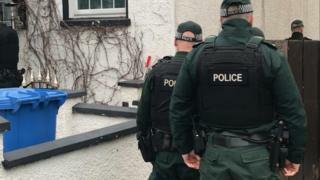 The court heard that suspected cocaine with a street value of £15,000, as well as UVF flags, were found in the home of Andrew Crawford, of Cairndore Grange in Newtownards. The police officer said the alleged drug-dealing operation is linked to the east Belfast UVF, which, he added, "consistently uses violence". Applying for bail, a defence solicitor told the court that the case against Mr Crawford was a "scary experience for him" and that he "is worried about his job". The police officer opposed bail because of "the seriousness and gravity" of the "overwhelming" case against Mr Crawford. The judge refused bail, citing the "significant amount" of cocaine allegedly found in the defendant's home. Mr Rainey, of St Patrick's Walk, did not apply for bail and will appear in court again by videolink next week. The judge ruled that the case against him was a "standalone" case and separate from the other three. The four men were among nine who were charged after a operation on Friday by the PSNI's paramilitary crime taskforce. Class A drugs and "high value" cars were seized in the searches. Four men, aged 32, 47 and two 48 year olds, will appear at Belfast Magistrates' Court on 18 April, charged with being concerned in the supply of a class A drug.